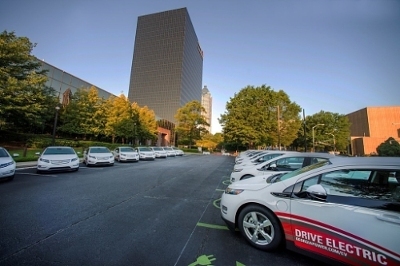 As the early summer sun rose on the parking lot of Georgia Power headquarters in Atlanta this morning, hundreds of Georgia Power employees, community and business leaders gathered for a special event around a glistening new fleet of plug-in electric hybrid Chevy Volts. Georgia Power Chairman, President & CEO Paul Bowers was joined by Commissioner Tim Echols of the Georgia Public Service Commission (PSC) and Michael Beinenson of the EV Club of the South to mark the addition of 32 new electric vehicles (EVs) to the company's fleet. "We are leading by example and demonstrating to our customers, and other Georgia businesses, that electric transportation works for all drivers," said Bowers at the event. "Through constructive regulation, and partnerships with organizations like the EV Club of the South, we are growing the EV market in Georgia and helping our customers reap the overwhelming benefits of driving electric." In 2014, Georgia Power launched a new electric transportation initiative to advance Georgia as an exceptionally EV-friendly state through its Get Current. Drive Electric.™ program. The program currently includes an ongoing public education campaign, EV charger rebates for business and residential customers and special rates and charging options for EV customers. 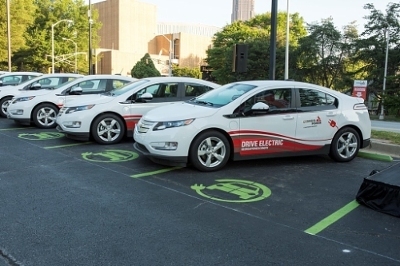 Georgia Power is dedicated to developing products and services which meet the needs of customers, including an increasing interest in EVs and electric transportation options. For additional information about driving electric with Georgia Power, including available rebate programs and resources such as an interactive savings calculator, visit www.GeorgiaPower.com/EV.